The glue sticks are easy to attach and the gun is easy to use. The glue gun from Mega helps to bond two items within seconds. The fold-out stand of the heat gun allows it to stand and accounts for easy storage when it is not in use. 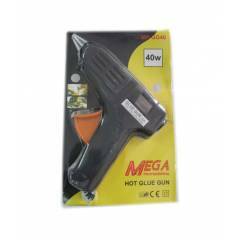 The Mega Glue Gun is an ideal tool for those who have to do repair and maintenance work at home. It is also ideal for workshops and DIY projects.